Burnley boss Sean Dyche expressed his delight at his side’s eclectic collection of goals ahead of the Championship fixture with MK Dons. And that satisfaction would’ve been exacerbated by the strikes that earned three points midweek as the Clarets climbed to third in the table. Sam Vokes and winger George Boyd netted in exceptional fashion to cancel out Carl Baker’s equaliser against the run of play. In defeat to Middlesbrough at the Riverside, the division’s newcomers were accused of “parking the tank”. But it wasn’t the case at Turf Moor as Karl Robinson’s side opened up in the early stages and showed more ambition. Rob Hall had the first opportunity when turning in to space from Jordan Spence’s pass, but his arrowing effort from distance rose above the crossbar. But that proved a rare opportunity for the visitors who spent the majority of the opening half on the back foot. Michael Kightly headed over at the back post when rising above Spence to meet Tendayi Darikwa’s delivery. Record signing Andre Gray then had an excellent chance to break the deadlock but the striker was foiled by David Martin when one-on-one after great work from Vokes to hold off his marker Kyle McFadzea. 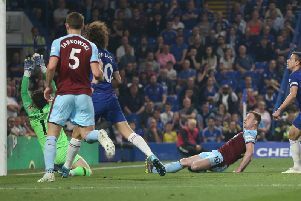 As the pressure mounted leading scorer Michael Keane powered a header over the bar after leaping above Anthony Kay to meet David Jones’s corner. With the Clarets mixing things up in possession, utilising the flanks and looking to penetrate centrally, the MK Dons defence was caught static again. Ben Mee’s clearance caught Dean Lewington and McFadzea flat footed, allowing Gray to race clear. The away side’s centre half was fortunate to avoid being penalised for tugging on Gray’s shirt, but the £6m man remained on his feet only to be denied by Martin once more. However, Burnley’s persistence paid off just after the half hour mark. Kightly beat Spence and moved infield from the left hand side, touched the ball in to the path of Vokes and the Welshman beat Martin with a rasping drive from outside the box. Lewington lifted a set-piece over the bar as the away side sought an immediate response while Boyd saw his volley blocked on the line after Darikwa’s cross was headed in to his path. As the fourth official lifted the board up to suggest a minimum of one minute added time would be played, the Clarets looked to be heading in to the interval with the lead. That wasn’t the case. Samir Carruthers, booked earlier in the half for dissent, eventually floated the ball over from the right wing and Baker, under minimal pressure, headed past Heaton to register his side’s first goal since the opening day of the season. Dyche’s half-time pep talk obviously inspired though as the Clarets restored their lead within five minutes of the restart. Gray, with an assist and a goal already to his name since his move from Brentford, picked out Boyd who rifled a spectacular left-footed volley in to the aperture between upright and Martin’s fingertips. Gray and Vokes went close with headers as the hosts looked to extend their advantage and substitute Matthew Taylor watched his attempt squirm wide of the post via a deflection. The Dons almost eclipsed their smash and grab antics from the first half when, in the final minute of five added on, Baker wriggled past substitutes Rouwen Hennings and Taylor before setting the ball up to the back post where Heaton, scrambling backwards, turned the ball to safety. But anything less than victory would’ve been extremely harsh on the hosts following a commanding display.